Thanatophoric dysplasia (TD) is one of the most common lethal skeletal dysplasias, which was first designated as thanatophoric dwarfism and described in 1967. The authors report a case of a Caucasian girl with TD, born to a 31-year-old woman without comorbidities. The newborn presented respiratory distress immediately after delivery, progressing to death in less than 2 hours. An autopsy was carried out after postmortem tomographic examination. The autopsy findings depicted extensive malformations of the skeletal system and the brain. 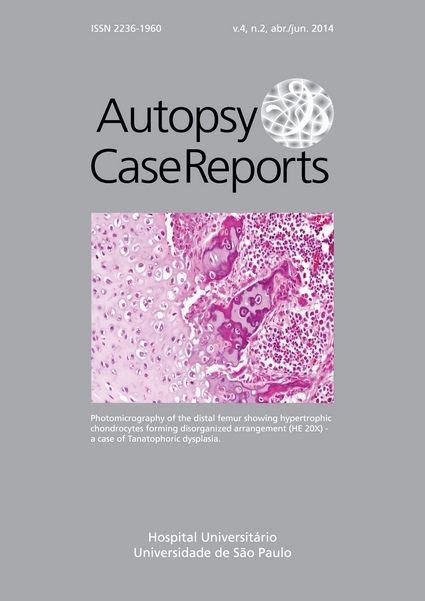 The aim of this report is to discuss the pathogenesis and correlate the morphologic features of TD that were disclosed at the tomography and the autopsy.